The kit that keeps you & your vehicle UK compliant! SKU: Product Code: Solo+DLK. Category: Digital Products. **PLEASE NOTE** – VDO have recently stated (01/04/19) that when the new Smart Tacho is released to enable you to download with an existing DLKPRO device it must first be updated with a firmware update card, these will be available from us at a cost that is not yet known. We have put together this kit to keep both you and your vehicle UK compliant. Teamed up with the latest in download key technology, the DLK PRO. 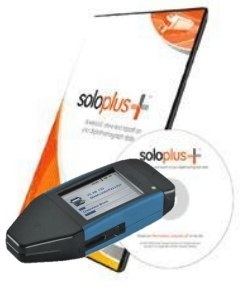 The TMS Soloplus+ software is an easy to use, cost effective way to be compliant with current digital tachograph legislation. It comes complete boxed with CD (software), quick start user guide & full user manual. Download & store your digital tachograph driver card and vehicle data. View driver card data in summary, detail and graphically. View vehicle fault, activity, speed and technical data. Print weekly and daily driver card summaries. This is the minimum solution to keep you compliant with UK law when using a digital tachograph. It couldn’t be simpler – the touch colour screen DLK Pro Download Key is the solution for the downloading of mass memory and driver card data – and for transferring it securely to a computer.Compatible with all Digital Tachographs. DLK Pro Download Key Software for key configuration, data visualisation and data archiving on the key. If you would like your digital tachograph data analysing please contact us, prices start from as little as 25p! Looking for a kit with a separate Card Reader?